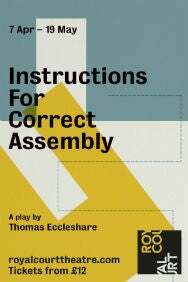 We do not curently have theatre tickets available for Instructions for Correct Assembly This could be because we have simply sold out or it could be that this show is no longer running. The information on this page remains purely for historical and informational purposes. Maybe turn down the ‘opinionated’ dial? Hari (Mark Bonnar) and Max (Jane Horrocks) weren’t satisfied with their first attempt at parenthood, so they’re giving it a second go. Only this time they’ve got a 30-day money back guarantee and an easy-to-follow construction manual. They’re certain, as long as they follow it step-by-step, he’s going to be perfect.